The title borrowed from Haren’s ride report, borrowed because, I deserve it more than anyone else. Life is always about squeezing a little more. No, no I don’t mean to sound like your boss, but hey, my wife is not a HR Manager for nothing. Anyway, what I was getting at is that, there was a helluva lot of traveling happening in the last 10days Bangalore-Cochin-Alleppey-Chennai-Bangalore and then I was off to Coorg again! But the annual RTMC pilgrimage to Cloud Valley in Coorg is a guaranteed un-winder, I needed a strong dose of that one! 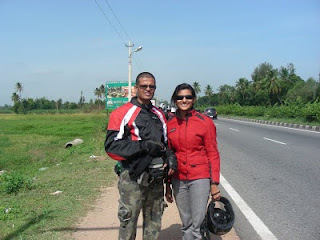 It would also be Shreya’s first overnighter with the bullet club and we started the Saturday, 29th May with gusto. We are both sufficiently cramster-ed now – mutually gifted riding jackets, saddle bags and waist pouch to carry everything from nail polish, comb (new additions to the luggage, or was it eye liner) and the usual – running shoes, sunscreen and spares. We joined about 25 bullets at Bangalore Univ campus at 6:30 or so. Just so there is no serious problem, I had given my bullet for service last week. First puncture in 20km from the start. In about 30mins with help from Horny, Tampon, Conrod and Dicso we replaced the punctured tube with a new one from Conrod. The rear shocks creaked like an old iron cot that creaks when you ‘sleep’ on it as you went up and down even on a slight bump. Group rides do provide a fair amount of insurance against break downs, accidents and other variables on the highways. 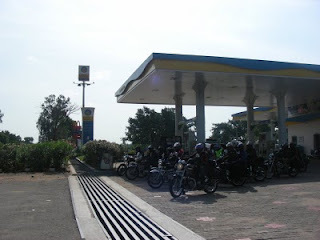 The entire band of bulleters waited at McD for us to catch up, a quick breakfast later, we were highway bound again towards Srirangapatana. I totally enjoyed the good roads to Madikeri, cruising at 80-90kmph. We reached Cloud Valley at 1pm and welcomed by Uday and his family. The inevitable pandi curry meal happened over ride stories and some poor jokes. 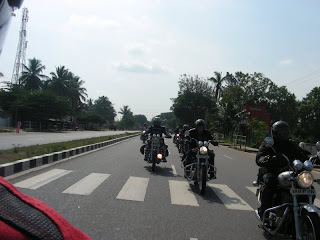 Those of us who weren’t high yet, made our way to the Cauvery river bed at 5, bathed and rode back. Some more ride stories and papad mama jokes kept us entertained around the camp fire right through the night. Cloud Valley itself is awesome. You should see my earlier report on this here. It is a nice report, go read! Apparently, the best time to visit is when the flowering season when the coffee seeds come into bloom and look like snow! The Jasmine-like aroma also fills up the entire region. So, I made quick enquiries in the evening with Uday ‘where can I go for a jog in the morning?’. I have become some kind of a fan of these runs - where you have no clue what’s in store, no idea of how long you are going to take to get back, where (if ever) you will find some water, civilization, etc. But I headed out on the path that had taken us to the river the previous evening. It was 6:30 and it was perfect for a long run. The trail took me on some serious uphills along winding coffee estates. There was not a single soul to ask for directions, you knew you were trespassing when the dogs barked louder. After about 4.5km, the path brought me back close to where I had started. Nice! I ran into the trail again, so I could finish a perfect 10! I am the rear tire of KA04-EM 1983, you have seen how I was born, right. It is here if you want a flashback. I have nearly done 15000kms on road now and my predecessor had taken care of the rear for about 40000kms. My owner is a nice guy (yes!) and he takes care to ‘fill me up’ with 30psi always. He likes to take me on good roads, bumpy roads and very very bumpy roads, but I like adventure too. I have been very loyal and have not disappointed him on any of his long rides… so far. So yesterday, just as I was warming up, something happened and suddenly there was air all inside me and in another moment the wheel was hurting me. That local tube inside me had a puncture. My owner should have known better not to buy a local tube from the “Aslam Bhai” mechs on the road side. Anyways, my owner, a big fan of DIY, fitted a new tube (Original!!) inside me, and I was happy again. My owner’s missus is a light lady and I have usually no problems with carrying both of them. But they stopped at this place where the milestone said ‘Hunsur 10’. There were people selling jackfruits. They are those big, heavy, thorny (I hate thorns) things that people like to eat. My owner should have put this in the front and the that lazy front tire should have taken some load. I must add that front tire is a senior one (55k kms), but had not worn out at all, because he does not do any work. He only takes the load of my owner’s arms and has good suspension to pass on the shocks from bad roads. If you ask me, the jackfruit should have been showed right through his valve. But, we hard workers are always made to ‘squeeze a little more’. That is life – as my owner says it. So the jackfruit came into one side of the saddle bag and the rest of the stuff was rearranged. Now when the owner started to ride, the mud guard started to flirt with me. It started to come so close and rub me in the wrong places. I started getting hot. Even the original rubber was able to withstand this and our safety was compromised near Bidadi. I tried to hold on as much longer as I could (I am very conscientious tire, you see), so it a while for my owner to realize the puncture. Luckily, I went fully flat near a ‘pancher’ shop. But the pancher guy was drunk and sleepy and despite taking all care, he patched the not-original rubber tube (remember the old one that punctured yesterday) very carelessly. I anyway didn’t like this duplicate rubber tube. So far it was still ok. It was still about 4pm in the evening. But we had just started the motions again, some 20k and then bam, one more flat. By this time, the wheel had started to bang me from the other side and it was slightly bent I think. I was feeling wobbly also. This time was terrible. My owner left his wife on the side of the road (very unsafe place) and put all his weight on the tank, standing on the foot peg and leaning in front and road me without air for 2km to get a puncture shop. This guy was ok, he put the puncture and in about 30mins, owner went back and picked up his wife. There were dark clouds and I am sure he wanted to get home before it rain. But, I like rain! So we started off again, the jack fruit load was still on me and I think I was dizzy because of the bent wheel. Anyways, it was now dark and we went another 20k and came to the NICE road. It is a very nice road and I was happy because there are no thorns, potholes or nails on this road. But just after the toll was paid, I went flat again. Promise, this was not my fault. It was the duplicate tube. I was focusing on my job and not paying attention to the mud guard also. This time there was more problem, it was raining, there were no puncture or pancher shops open (it was a Sunday) and my owner had to do his circus stunt again for 2km. But he was getting good at it, I didn’t feel too much load at all. I over-heard him tell his missus afterwards that he had only 260 bucks and the tube cost him 270! Four is too much, I say. But, there was one good thing, that jackfruit went off to the front in the end. That lazy front tire also took load. Then he rode me very very slowly, the last 30kms to his home. I felt very ashamed of myself. I will not do this again. I will not do this again. I will not do this again.